I don't have a pedal box setup, I want to just set the tight arse next to the amp and use a short cable to connect it. Is there a name of cable that I want? I presume a 'short arse' cable won't cut it? RedVee wrote: I don't have a pedal box setup, I want to just set the tight arse next to the amp and use a short cable to connect it. Is there a name of cable that I want? I presume a 'short arse' cable won't cut it? how are you guys using it live, last pedal before the DI? 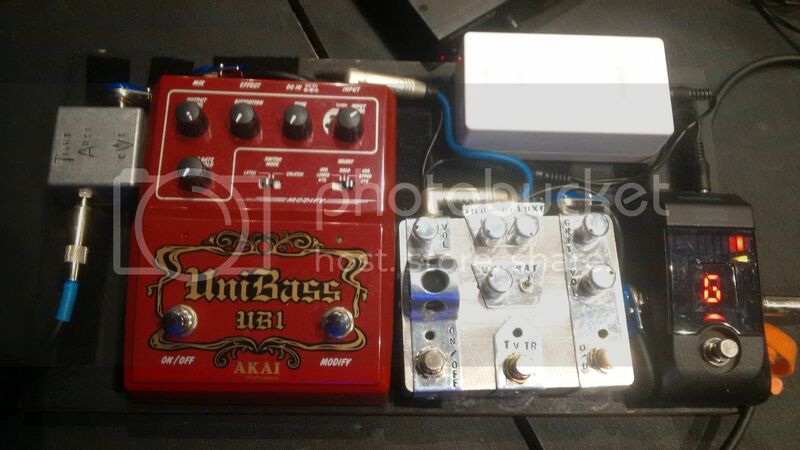 Bass - Tight Ar$e - Zoom B3 - amp head - cab(s). BazzBass wrote: how are you guys using it live, last pedal before the DI? "Better to remain quiet and be thought a fool than open your mouth and remove all doubt"
ok, i was mucking around yesterday having bought a 'short arse' (patch) cable to go with the Tight Arse. which is what I'd need to do anyway if I went out of the zoom via DI, I guess. I dont think I've written arse that many times in a para before. is anyone running their Tight Ar$e with a GKMB500? Going in the front, I get a subtle reduction in the low end, but if I put it through the effects loop I lost WAY more bass, to the point that it is unusable. I've tried the TA into the effects loop of my TH500 and it was fine. If someone has the MB500, could you please try it though the effects loop and see how it goes? I can't tell if it's my unit or an MB500 thing. I'm not sure if this helps but I used mine through the effects loop of my Epifani UL902C (last thing before the return in) and it sucked the life out of my rig. I had very little bass, I had to crank the volume up to about 90% to get anything out of the amp (in either passive or active mode) I started to get some distortion and I thought I had done something wrong. I removed the unit and bam, there it was, my normal sounding rig. I was on a very tight setup and play schedule so I just left it out for the whole night and despite my great intentions I didn't get a chance to setup my rig and test it today. FYI I run the effects loop in series, I come out of the amp, into my compressor, into an Tech 21 RBI back into the amp. I used the TA last week into a practice rig out of a Sansamp Bass driver into a PA and it did not do the same at all and worked well.